My SanDisk 4GB Extreme III SDHC (Secure Digital High Capacity) arrived today. Well, technically, yesterday, since it is now technically "Saturday morning." I did not get it from Dell, as mentioned in my earlier post, however. Apparently Dell had trouble getting the card in stock, and after needing to delay the shipment a second time, they informed me that they must obtain confirmation from me to keep the order, or they would have to cancel it, due to some law or regulation. As I also did not want to keep waiting for who knows how long, I placed an order from J&R on Wednesday, who I've ordered from before through Amazon, and opted for the 2nd Day Air shipping method. Why "Extreme III"? Well, it has a transfer speed of 20MB/s, or 133x. For recording videos, Panasonic recommends a card with at least a transfer speed of 10MB/s, and SanDisk's next class of SD cards are "Ultra II," which are 10MB/s--10MB/s read, 9MB/s write. That's pushing it a bit close for me, so in my opinion, it's better to go high than low. Plus, with a 7.2 megapixel camera, the pictures will mostly be larger in size, so having a higher transfer speed never hurts. With the transfer speed, there's something important to note--Officially, SDHC cards have three class ratings--Class 2 for at least 2MB/s, Class 4 for at least 4MB/s, and Class 6 for at least 6MB/s. Anything faster than that are all Class 6, which is why you see a "6" enclosed in a larger "C" printed on the card. It also means both the "Ultra II" and the "Extreme III" are "Class 6" cards. Which is why the "Class 6" rating doesn't hold too much meaning these days. If you need a certain transfer speed, it's better to find a card that either lists the megabytes per second rate, or a multiplier rate (such as 133x, where x is "multiplied by 150 kilobytes per second"). If neither values are available, and you need a card that transfers faster than 6MB/s, move on. Incidentally, SanDisk is not the only manufacturer that has these high speed SD cards. At present, I know of Panasonic and Transcend SDHC cards that are 133x and 150x, respectively. Have not yet found an 8 GB SDHC card with that transfer speed, however. You'll also notice in the picture that the card came with a "MicroMate" USB card reader. That's because SDHC is a new standard, so while devices that support SDHC can use either SDHC or SD, older devices that can read SD probably can't read SDHC cards. So the USB reader fixes that problem. Plus it's USB 2.0. For some strange reason, Panasonic did not deem it fit to equip the SDHC-supporting TZ3 camera with USB 2.0 compatibility when connecting to the PC. 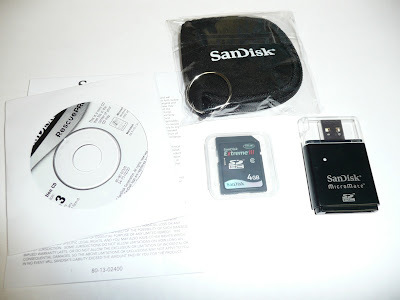 The card also comes with a neat little carrying pouch for the USB reader, a case for the card, and SanDisk's RescuePro software, which can be helpful in trying to retrieve data from a corrupted card, or accidentally deleted data. I've only taken a few pictures with it, but I like it. The transfer speed is fast, and the USB reader makes the card (or any SD/SDHC card) double as a flash drive.